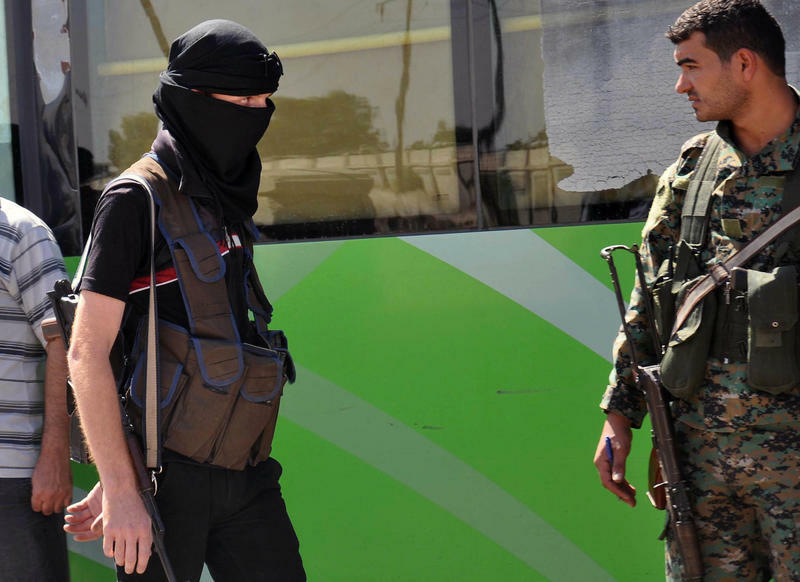 An anti-Syrian government fighter, left, looks at a Syrian soldier, right, as he leaves the last besieged rebel-held neighborhood of Al-Waer in Homs province, Syria, Monday, Sept. 26, 2016. Landis said rebel groups, including ISIS, occupy about 50 percent of Syria’s land. He counts over one thousand rebel groups in Syria, but only seven signed the cease-fire. In the meantime, the United States is engaged in bombing ISIS-held territory and recently killed 30 senior Al Qaeda officials who were suspected of planning terrorist attacks against the West. “The U.S. is flying over the skies of Syria, bombing things. And so is Assad and the Russians. So it’s very difficult to know who is where, who is a signatory to this because jihadist groups are marbled throughout the rebel territory,” Landis said. Landis does not see a political solution to end Syria’s bloody civil war. Too many rebels want an Islamic state that supports Sharia law. Assad and religious minorities want nothing to do with an Islamic state in which they would become second-class citizens. At the same time, Assad sees the rebels as traitors. “It’s not a situation where there’s a political solution that you could say, jeez, everybody is going to put down their guns and they’re going to figure out how to live together,” Landis said. In the end, the rebels have two options and neither of them are good. They can either flee to Turkey, where they are unwelcome, or they can continue to fight.